Furnacecompare.com reports, 2nd June 2017: Pelamis Wave Power (Pelamis) was the first company to produce electricity on a commercial scale by harnessing the power of ocean waves. 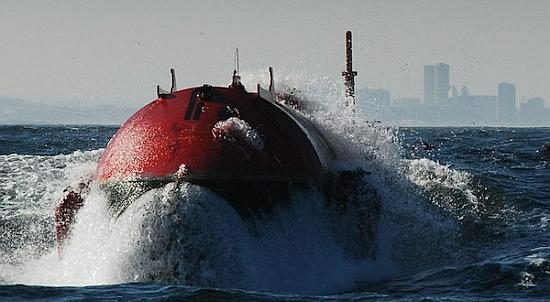 The Scottish company was established in 1998 and designed the technology used in several off-shore wave energy production projects. However, Pelamis closed its doors in 2014 due to a lack of funding. Corporate History: Pelamis was founded in 1998 under the name “Ocean Power Delivery”, but changed its name in 2007 to Pelamis Wave Power. The name Pelamis originates from a Greek sea-snake found in shallow tropical waters. The company was headquartered in in Edinburgh, Scotland. Founders Richard Yemm, Chris Retzler and David Pizer based their technology on a device known in academia as “Salter’s Duck”. Stephen Salter, a professor at the University of Edinburgh, pioneered the conversion of ocean surface waves to electricity. In 1974, Professor Salter’s research on marine energy led to his invention of the “Nodding Duck” or the “Salter’s Duck” which converts raw wave energy into usable electricity. The device has a teardrop structure wherein the nose or the head of the machine is pointed towards the waves. Inside the Salter’s duck is a set of pistons connected to a hydraulic motor. As a wave passes, the device captures about 90% of the wave’s energy through its bobbing motion. The process triggers the pistons that pressurize the hydraulic oil which will then activate the hydraulic motor. The Edinburgh Wave Power Group has published several images and diagrams. P1: Pelamis’ first operational prototype, the P1, was installed at the European Marine Energy Centre (EMEC) at Billia Croo, Orkney, Scotland. Measuring 120m in length and 3.5m in diameter, the converter was made up of four different tube sections. Aguçadoura Wave Farm Project: After the successful demonstrations of the P1, the company received orders for three additional units. The three 750kW machines were installed at the Aguçadoura Wave Farm, just off the north-western coast of Portugal. The Aguçadoura project was funded by the Portuguese utility company Enersis and backed by the Australian investment company Babcock & Brown. Although Aguçadoura successfully generated electricity beginning in July of 2008, the three P1 units were towed back to dry dock in November after developing technical problems. Although the units were successfully repaired, Babcock & Brown then ran into financial difficulties and attempted to sell them. They were never redeployed. P2: The data gathered during the use of the P1 between 2004 and 2007 formed the basis for the development of the P2. Instead of featuring four sections, the P2 included five sections. Measuring 180m in length and featuring a diameter of four meters, the P2 weighed approximately 1.35 tons. Pelamis received their first order for a P2 (known as P2-001) from the German company E.ON, UK, in 2009. After its installation at the EMEC test site in October 2010, the 750-kW P2 underwent a three-year testing period, and then was eventually decommissioned after completing more than 15,000 hours of operation. The renewable energy company ScottishPower Renewables (SPR) purchased the second of the P2 wave converters, known as P2-002. The P2-002 was installed by SPR in the EMEC in Orkney, Scotland, where it ran from 2012-2014. The Inverness Press & Journal reported in 2016 that SPR eventually sold their P2 to EMEC. In 2016 EMEC requested input from the industry on the best ways to put their P2 (which is berthed at Lyness in Scotland as of June 2017) to use. Aegir Wave Farm: In 2010, Pelamis Wave Energy joined with the Swedish utility company Vattenfall in the creation of Aegir Wave Farm, off the coast of the Shetland Islands. Vattenfall cancelled the Aegir Wave Farm in February of 2015, after Pelamis went into administration. How Much Energy did the Pelamis Generators Produce? The three P1 units that were intended for installation in the Aguçadoura Wave Farm would have theoretically generated 2.25MW of electricity at peak output. There is a commonly used rule of thumb in the US which suggests that 1MW of electricity can power 1,000 homes, and using this heuristic, the 2.25MW of electricity would have powered about 2250 homes. After completing the manufacture of the second P2, the company announced layoffs in 2011 and then went into “administration” in 2014. When a company goes into administration in Scotland, the court appoints an administrator who is in charge of winding up the company’s affairs: looking after creditors, debtors and shareholders. In Pelamis’ case, the Scottish government created a new organisation called Wave Energy Scotland (WES). WES is charged with ensuring that Scotland maintains a leading role in the development of marine energy. Pelamis’ remaining assets were transferred to WES. Much has been made of the theft of four or five laptops from the Pelamis Wave Power plant in 2011 after a visit from a Chinese delegation interested in the technology. When a Chinese company, the China Shipbuilding Industry Corporation (CSIC) debuted a similar wave energy converter in 2014 the term “industrial espionage” was repeatedly mentioned, but no direct evidence was presented or formal claims pursued. In Nov, 2016, Zeng Rong, a spokesperson of the Chinese embassy in the UK wrote a letter to the Guardian newspaper, arguing that the CSIC’s Hailong 1 wave energy converter was developed independently from Pelamis’ technology and that there were “huge differences… in terms of design, appearance and structure of the joint”. While wave and tidal energy may become a source of clean and renewable energy in the future, there are still many hurdles for this promising technology to overcome before it will be widely available. Marinet observes: There are a number of marine technologies capable of delivering renewable energy to the UK : tidal lagoons, wind turbines, tidal streamThe flow of water through channels or around coastlines as a result of tidal water movement, and wave power. If developed fully they could, combined, deliver between 30% and 40% of the UK’s current electricity needs. This is significant. Not only does it take us a long way down the road to a carbon neutral energy policy (assuming transport and heating go electric in the future), but it also provides this energy from UK resources thus eliminating the need to rely on foreign countries (energy security), and suggests that there is a substantial industry for the UK to develop with many overseas commercial opportunities. Equally significant is the fact that these marine technologies are capable of working together to provide electricity on a continuous, reliable basis — thus solving the issue of “base load”. Meeting the need to generate base load has long been used to justify fossil and nuclear generation, but a combination of marine technologies can solve this. What is missing at the present time is a Marine National Grid, comparable to the land National Grid, into which all new generators and suppliers of electricity can readily connect, thus making the economics of production viable. If a Marine National Grid, as a core national energy infrastructure project, can be established then the marine renewable energy industry will begin to prosper. Marinet is currently exploring with the marine renewable companies whether they are willing to work co-operatively to develop and argue the case at UK Government level for a Marine National Grid. If you would like to assist with this, please contact us.